It’s a struggle to be a Filipino-American these days, y’all. And although I still balk at calling myself “Fil-Am,” I feel the struggle both ways, in all its multiplicity. The Philippines seems to be at the mercy of a perplexing president whose politics are at best confounding. Following his declaration of martial law in Mindanao (southern part of the Philippines), he also withdraw from ongoing peace talks with the revolutionary (and underground) government of the country (strongest in the countryside). Mis sentidos en guerra con el mundo: fue frágil armisticio la lectura. Reading as a truce, reading as a tool — that’s what this blog has always stood for. I’ve compiled books to help us through these times, like this list of reading for resistance. I also just reviewed a book on tyranny and offered up my response, based on my experience as an activist. As a Filipino in the face of martial law, here’s my blog’s literary antidote. Even more timely is an exploration of Alexander Von Humboldt’s life, possibly the very first man to confirm man-made climate change. We feel very strongly that our own wisdom begins where that of the author leaves off and we would like him to provide us with answers when all that he is able to do is provide desires… That is the value of reading and is also its inadequacy. To make it into a discipline is to give too large a role to what is only an incitement. Reading as an incitement, a tool to spur us to action. I think I like that better. It’s been exactly one month since I got to the U.S. from the Philippines. The first few days back almost negated the entire three weeks I was there with my family, in really confusing and frustrating ways. Jetlag and homesickness were daily themes, as my sisters and I tried to console and comfort each other. We looked at photos, relived memories. Each new detail we discovered about our trip brought us immense pain and also joy. We would laugh, and then cry. We made pacts, we changed our plans. For us, there was only one thing that became prevalent: we needed to be back home as soon as we can, in Pampanga. 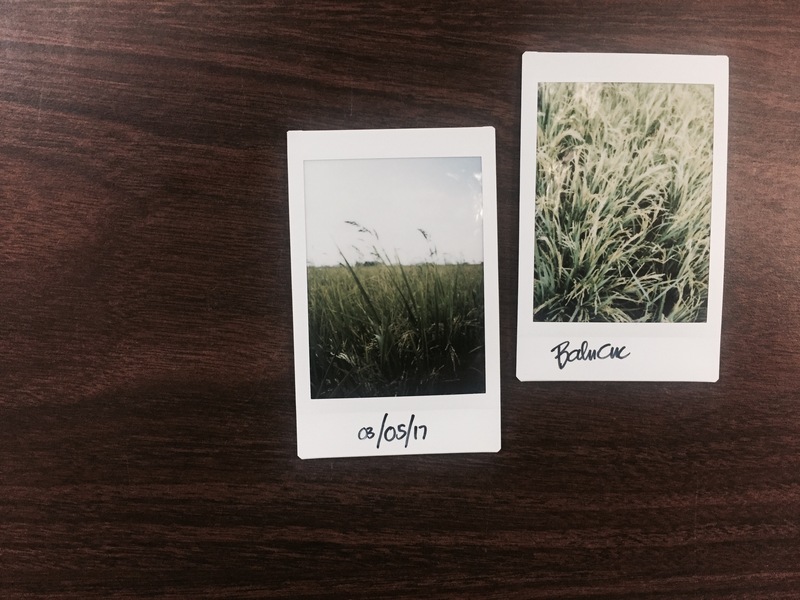 I started to think about all the photos I took — most on my phone, some on my Instax. I’m missing a lot of the photos too, and I pray to all the gods that they’re just hiding in bags or notebooks somewhere, not lost. Since this trip was our first back as a family after migrating to the U.S. in 2004, it was life-changing. We went to different places, famous landmarks, touristy areas and old spots we used to go to when my sisters and I were younger. And as I always tend to do every time I feel vulnerable, I started thinking of folks who have stirred me with their words. In Balucuc, close to my hometown Apalit, we had lunch in the middle of rice fields on a Sunday. I thought of Tomas Tranströmer’s book of poems Preludes. Two truths approach each other. One comes from the inside, the other from outside, and where they meet we have a chance to catch sight of ourselves. I come from a family of farmers, on my father’s side. I remember some days when I’d come home from school with the front of our house turning into a makeshift rice-drying areas, with men raking in newly harvested rice, gently back and forth. I thought of my grandfather. Our house too looked different. I thought of Teju Cole quoting Marcel Proust, in Known and Strange Things. Proust in a letter, “We think we no longer love the dead because we don’t remember them, but if by chance we come across an old glove we burst into tears.” Objects, sometimes more powerfully than faces, remind us of what was and no longer is. Teju resonated with me so much, in so many different times. How funny that you can convey a feeling in several ways, whether that’s in Tagalog or German. The German word for homesickness is “heimweh.” Legend has it that Swiss mercenaries from the fifteenth century onward, dispersed throughout Europe to fight foreign wars, were hardy soldiers susceptible to few weaknesses. But they missed home with a deranging intensity, longing for the high elecution of their cantons, their clear lakes, their protective peaks. This feeling they called, in their Swiss German, heimweh. I wrote in a journal, just as I remember Susan Sontag doing in As Consciousness is Harnessed to Flesh. I was with her when she said that “the ultimate fantasy is the recovery of the irrecoverable past.” Seeing my friends brought all the feelings, as well as a deep well of gratitude for these connections. In Baguio, my sisters and I thought of summer vacations when we would indulge in strawberries (the only time we could), go on a boat at the lake, look at our parents at a different light amidst the fog. Secretly we are all looking for ways to continue our childhoods — the hurt, the pain, the love, the fear, the shame. Photography is inescapably a memorial art. It selects, out of the flow of time, a moment to be preserved, with the moments before and after falling away like sheer cliffs. And of course, if there’s one person I should quote when it comes to the art of traveling, it’s Alain de Botton. I’m still floating, at times dreamily, thinking of home. I guess I’ll never really be able to anchor myself where my feet are planted, because once you know where you’re supposed to be, you don’t stop until you get there. I was talking to a friend the other day, someone who shared my love for literature and I mentioned that I’ve been reading a lot of contemporary fiction and nonfiction as of late — that I feel like I should delve into classics a little bit more. She said that there are a lot of contemporary fiction that are good which made my literary heart swell. And it’s true, most of the releases I had the chance to read this year blew my mind. The New York Times came out with their best books of 2016, two of which I reviewed on the blog. Buzzfeed also came out with their own list, similar to what has been featured in the NYT and on this blog. Coming up with only five books was hard, but there were a number of considerations. I like to think of Libromance as a living and breathing part of the world, wherein books featured reflect the struggles of our time. Whether these are external factors — political nightmares, increasing state violence, etc. — or internal factors — the need for security, means for survival, our capacity to love — the decision to narrow it down to just five was a meaningful and intentional process. …the story of Cora, a slave who ran away from a plantation in Georgia through a real-life railroad built underground. She used the railroad three times: one heading towards the Carolinas, the second towards Tennessee and then Indiana. Historically, the “underground railroad” was a network of secret routes and safe houses, established by abolitionists and free slaves to aid black folks to get to free states. …I usually try to finish a book in a week or two but I stayed with Teju’s new book for about a month, as I processed each essay and its significance differently, in the context of a queer Filipino immigrant experience in the United States. …the love stories we see and hear about are really only the beginning of those relationships, Alain de Botton argues, in his new book The Course of Love. What happens after the proposal, followed by the wedding, are the lives of two people bound not by romance alone but by the humbling reality of living with another person. …reading Yaa Gyasi’s Homegoing at the time of Alton Sterling and Philando Castile’s deaths was surreal, as if I was looking at the lives of these two black men from a generational perspective, with Gyasi’s historical fiction lens. …writing about war is never an easy task, it involves remembering what must not be forgotten, slowly treading a path in one’s memory that is never neutral. It is filled with opposing forces — of heroes and villains, of the noble and the wretched, of the conqueror and the conquered. But it must be done. This, I believe, was Viet Thanh Nguyen’s task with his Pulitzer Prize winning novel, The Sympathizer. These books shook, carried, woke me in infinite ways, beyond my own experiences as a queer Pinay immigrant. There were many that didn’t make the list and you can always check those out here. Have you read any of these books? Let me know in the comments below! My book list is looking good and I’m giddy with excitement. 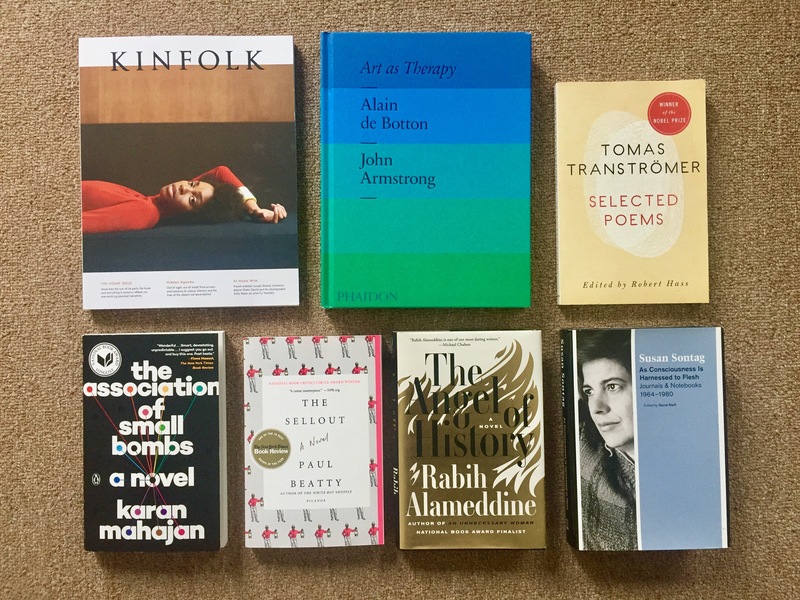 For the next few weeks, I’ll be plowing through a few titles, hurling myself in various worlds and literary texts and I cannot wait. So much so that I had to put Fernando Pessoa’s book The Book of Disquiet down because a third into Soares’s observations of downtown Lisbon, I realized reading it was meant for another time. I started Karan Mahajan’s The Association of Small Bombs and I can see why the book was shortlisted for the 2016 National Book Award for fiction (ceremony & awarding is on November 16!). Along with Mahajan’s book, I’m ecstatic about the following books I’ve chosen to immerse myself in this month. After reading the first compilation of her journals and notebooks in Reborn, I knew I had to get As Consciousness is Harnessed to Flesh by Susan Sontag who is easily becoming a favorite. I was moved by her writing on love and queerness and by the critical ways she sought to understand the world — I couldn’t help but ask for more. The next few titles are ones that I’ll be reading sporadically, in no particular order as I would the previous ones. Tomas Tranströmer’s Selected Poems, Alain de Botton’s Art as Therapy and the latest issue of Kinfolk magazine on Home are all supplements to this month as shorter days and longer nights abound. What’s on your list this month? Do share in the comments below! Ideally, art would give us answers that other people don’t. This might even be one of the main points of literature: to tell us what society at large is too prudish to explore. The important books should be those that leave us wondering, with relief and gratitude, how the author could possibly have known so much about our lives. It is with utmost relief and gratitude that the writer Gabriel García Márquez must have felt, upon having his work translated by the revered Gregory Rabassa (pictured above) who has died at the age of 94. Translating is a very difficult job, not at all rewarding, and very badly paid. A good translation is always a re-creation in another language. That’s why I have such great admiration for Gregory Rabassa. My books have been translated into twenty-one languages and Rabassa is the only translator who has never asked for something to be clarified so he can put a footnote in. I think that my work has been completely re-created in English. Knowing who we are is central to understanding our deepest problems, but how far can one go in proclaiming that we actually don’t? Dive deep into a dear sister-in-the-struggle’s response to a piece that omits an entire movement’s efforts of genuine nation-building, central to the question of who we really are. If all else fails, you could also dress the part. Here’s a delightful blog on dressing like books.